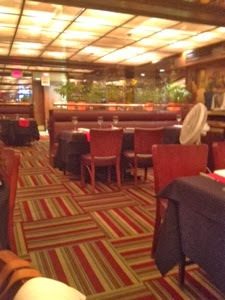 A few months back my mother invited me to a dinner at Alexandre et Fils. The dinner was a potential “goodbye” dinner for a new co-worker who was potentially being deported back to scary old Baltimore, MD., and who quickly became my new favourite dining partner and friend. 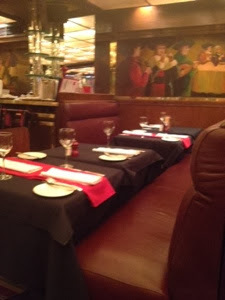 We sat down in a slightly run down looking restaurant and I was reassured by a fellow diner that this place was in fact a great restaurant – even though air conditioning consisted of a large fan near a window (HELP)! I glanced over the menu and sipped my glass of water and could not decide what to have. 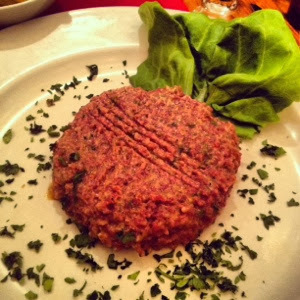 I finally decided on the escargots to start followed by the beef tartare. 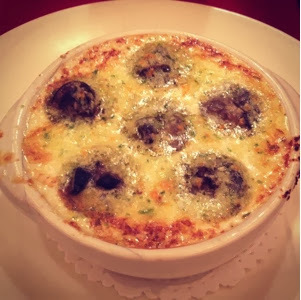 The escargots were absolutely delicious and perfectly cooked. The delicate yet vibrant flavour of the garlic drowned in the delicious butter was so yummy that it insisted on being mopped up with a few delicious pieces of bread – a perfect start. 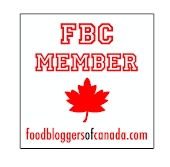 The “deportee” of honour started her meal perfectly as well with the warm goat cheese salad. Crispy and thinly sliced baguette croutons delicately protected a beautiful mixed green and radicchio salad drizzled with a delicate vinaigrette. 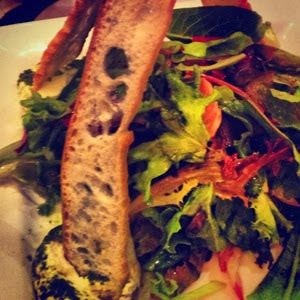 The warm goat cheese was the perfect touch to finish this delicious salad. A classic Caesar salad was also ordered and enjoyed by another diner at my table. 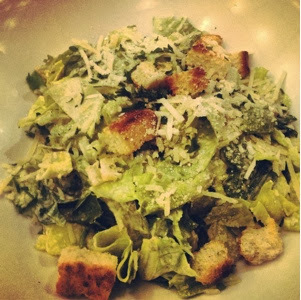 Topped with crispy croutons and shaved parmesan, this salad was good but didn’t stand out as extraordinary. My mother ordered the beef carpaccio and was very pleased. The dish was delicately flavoured and beautifully presented; the chef let the flavour of the beef shine through by not over-powering the dish with too many strong flavours. 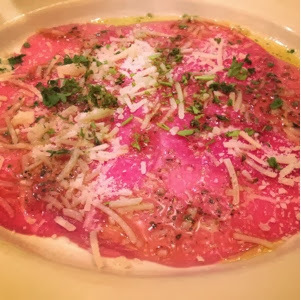 The parmesano reggiano shredded onto the Carpaccio complimented the beef perfectly and added the perfectly saltiness that this dish needed. The appetizers were great and I was excited for the mains – little did I know how sick I would be about six hours later... I made the mistake of ordering the beef tartare, it was brought to the table and prepared table side. I did not see this (the waiter was behind me and I was distracted talking to someone), but as my mother watched the waiter crack a raw egg into the beef, she knew I would be sick later on - why she didn't tell me until after I began puking I’ll never understand! I dug into to this dish and really enjoyed the bold dijon flavour and fresh herbs – it was good going down but terrible coming up! The presentation on this dish can only be described as bizarre yet simple, that’s all I can think of to describe a giant piece of lettuce as the top hat to a circle of beef mush poked and gently swiped by a fork – kind of like my Dad serves his spicy tuna on dairy dinner nights. 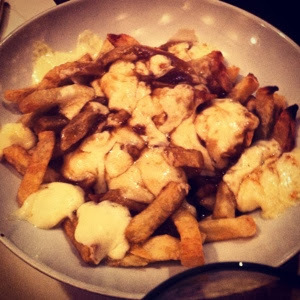 The guest of honour had an onion soup au gratin and a poutine – an American girl who aims to eat every poutine in sight. 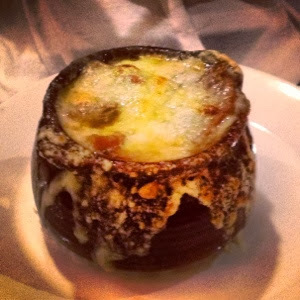 The onion soup really good and she enjoyed it very much. The poutine to me was mediocre, but my friend enjoyed it and had no complaints. 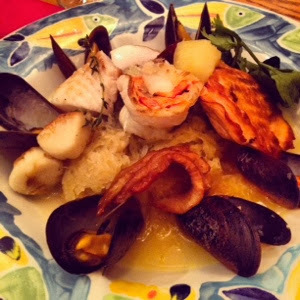 My mother had the "Choucroute de Mer," a sort of seafood stew, that was served steaming hot and smelling absolutely delicious. The flavours were great but I thought the seafood was either not fresh or slightly over cooked, I really couldn’t tell but there definitely was a mild distinct fishy taste. My mother enjoyed her meal but also complained later that she felt sick and nauseous. As we left the restaurant and walked the few blocks back to our car, I couldn't help but notice how nauseous I was. I didn't think much of it at first, but in the middle of the night, I knew exactly what that feeling was. I was sick all night and into the next day. Needles to say I will not be returning to Alexandre et Fils any time soon.